For every blessing, a curse. What might have happened had I not confronted this evil? Truly fortune smiles upon me. Yet each time I face such beasts and witness such horrors I wonder: What if the subtle forces forging my path are not a blessing, but rather a curse? Perhaps the unseen hands shading my fate seek only to push me toward oblivion. Powerful new Ancient Ones have awoken, bringing with them dangerous monsters and terrifying new mysteries. 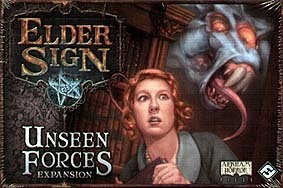 In these dark times the investigators seek new allies, spells, items, and blessings from mysterious powers. They must be careful dabbling in the unknown however, for a terrible curse lurks in the darkness, waiting to drive them to their doom! Will you brave the museum once more?